Ritual of the Night was announced as a Kickstarter in 2015. Koji Igarashi, a Konami veteran who worked on the Castlevania series for nearly two decades, asked fans for $500,000 so his newly-formed game studio, ArtPlay, could make a spiritual successor to the series. The campaign ended up raising $5.5 million. Since then the game has been delayed twice. The Wii U, PS Vita, Mac and Linux versions of the game were cancelled, and a Switch version was announced. It’s now set to arrive later this year, releasing at least on the Switch by this summer, according to a trailer from the February Nintendo Direct. On paper, Ritual of the Night looks like a Castlevania game. Everything you’d expect is there: conjuring various familiars, enemies knocking you back when you get hit, and even a connection to the previous games via Igarashi. But in the demo I played, things don’t quite come together. Everything felt a little off, like a piece of furniture that looks fine from afar but wobbles when you use it. My session started in the middle of a giant clock tower in Demon Castle. Miriam, the main protagonist, has awoken from a 10-year coma after magical crystals were put into her body. She’s ventured to the castle to kill another subject of the experiment who’s letting demons take over the world. At the demo’s start, she had already collected a number of crystals enabling her to perform all sorts of special attacks. Her inventory is likewise full of various regenerative potions, crafting materials, and other loot. With all of this in tow I set about exploring my surroundings. The first thing I noticed was how dark and grimy the world is. Ritual of the Night isn’t exactly an ugly game, but at least in the demo I played, Miriam and the other characters felt detached from the environment, like actors performing in front of a green screen. Miriam’s animations are fluid but she’s not quite tethered to the ground. In a platforming section involving spinning gears, she stood just above them as they turned. While the arcs of her double-jump feel accurate and satisfying, they feel out of sync with the various platforms jutting out in the game’s 2.5D world. This lack of harmony carries over into some of the combat. 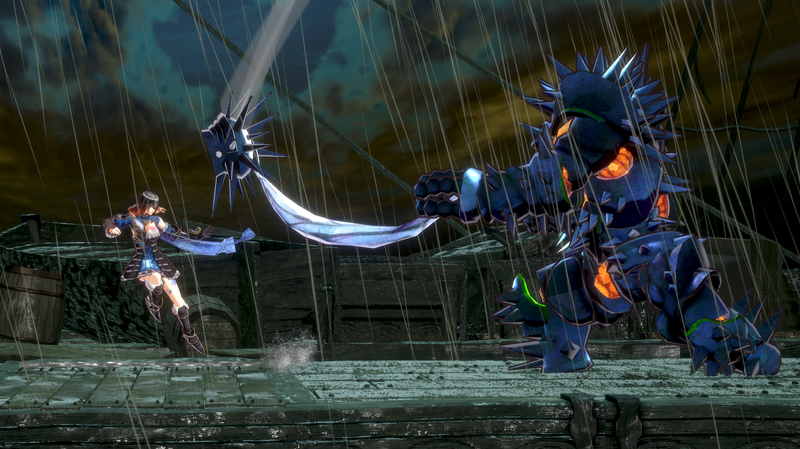 Miriam can handle various medieval weaponry and dodge backwards or slide forwards to avoid foes. She has special attacks like fireballs, and throwing knives, and she can summon demonic tentacles to attack, each of which consumes magic points. 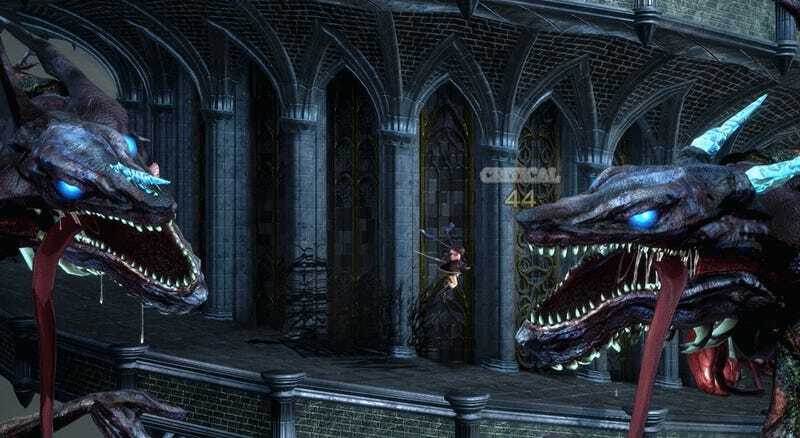 These special attacks are helpful for dealing with less conventional monsters, like a flying harpy or armored knight hiding behind a giant shield. Special attacks don’t feel as powerful as they should in moment-to-moment combat. Damage is shown via numbers, but there’s little in the sound or visuals to make the math feel visceral. Sometimes fights can feel like clumsy brawls where you just exchange health with opponents until one of you dies. This came through strongly during the demo’s boss fight. A two-headed dragon cornered me on one level of the tower, with each head taking up one side of the screen. I had to dodge their biting and fire attacks and then counter with my own, but I often found myself confused about where the enemy’s hitbox began and mine ended. Miriam would take damage but not suffer the normal amount of knockback, and my attacks landed with little visual or auditory feedback. The combat animations looked great, but the actual fight felt like tangoing with a ghost.